CTM-100, Bass Guitar Amp Head from Ashdown in the CTM series. 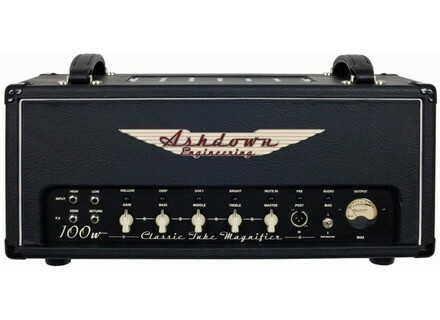 After the 300W CTM300, Ashdown Engineering will introduce at NAMM 2013 two 100W and 15W Classic Tube Magnifier bass amp heads. The CTM100 is an all-valve bass amp head that delivers 100W RMS of power with separate outputs for 2, 4 and 8 Ohm impedance cabinets. The amp hosts dos ECC82/12AX7, two ECC82/12AU7, one ECC99 and two 6650 tubes. And to keep the beast cool, a fan is installed inside the amp with large vents. The user will be able to control the three-band equalizer, a gain for the two-stage gain section, and the Master. Additionnal switches allow for shaping the sound: Mellow for the tone, Bass shift tone for deep/ clean bass, Mid shift which moves the frequency of the mid control for further shaping, and Bright for enhanced definition at lower volume settings. A tube-driven DI output is also on the menu, as well as a user-settable bias for each individual power tube with calibrated, dual function classic VU meter on the front panel when in bias mode. The VU meter is also used to monitor output when in audio mode. Lighter and more compact than the 19kg CTM 100, the CTM15 is a simple version of the CTM preamp paired with an all-tube power section, derived from the classic LB 30H, and delivers 15W RMS of power. You can adjust the gain, bass, middle, treble and master and the head also includes a classic Vu meter. It will fit almost anywhere with its 140mm, 5.1” x 235mm, 9” x 155mm, 6.10" dimensions and 5kg / 2.3lbs. More details are expected soon on ashdownmusic.com. [NAMM] PRS Gary Grainger Signature Basses PRS introduces the evolution of the Gary Grainger Signature bass line with the new Gary Grainger available in 4 and 5 strings. [NAMM] Pigtronix launches three bass pedals Pigtronix will introduce at NAMM 2013 three new phaser, compressor and overdrive pedals designed specifically for bass.